It’s not perfect, but it's the simplest design we’ve seen. There are basically two ways to install smart lighting in your home. You can install a smart switch, or you can install smart light bulbs. The problem with smart bulbs surfaces when you install them in lamps or sockets that are controlled by the dumb switch on the wall. Turn off the switch and you’ll never be able to control the bulb with an app on your smartphone or tablet, because no electricity is flowing to the bulb. 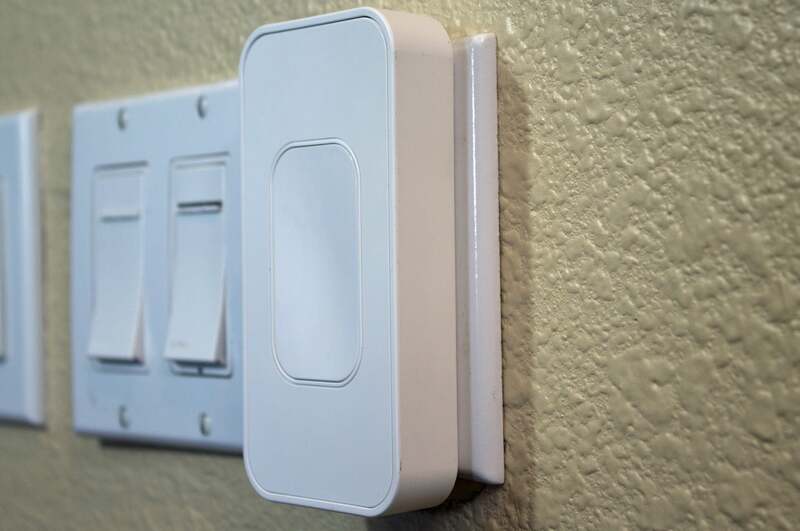 Smart switches are the better alternative, except that most require a central hub to control them, and—unless you’re comfortable dealing with live wires—an electrician to install them. 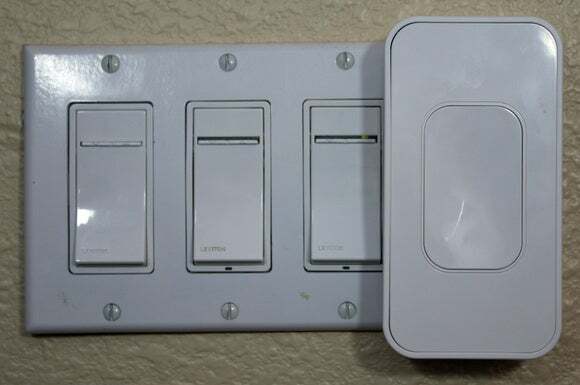 If you’re a renter, you can forget about smart switches altogether. 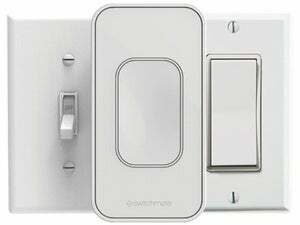 The Switchmate team came up with a better idea: A smart light switch that mounts on top of your existing switch. When activated by a Bluetooth signal or a touch of your finger, a motor moves a simple lever up or down against the existing switch (there’s one model for toggle switches and one for rocker switches) to turn the light on and off. The Switchmate can turn control ceiling and bathroom fans—or anything else that’s controlled by the switch—as well. Magnets on the back of the Switchmate attach to the screws holding your existing cover plate in place. Just stick it on; no tools needed. 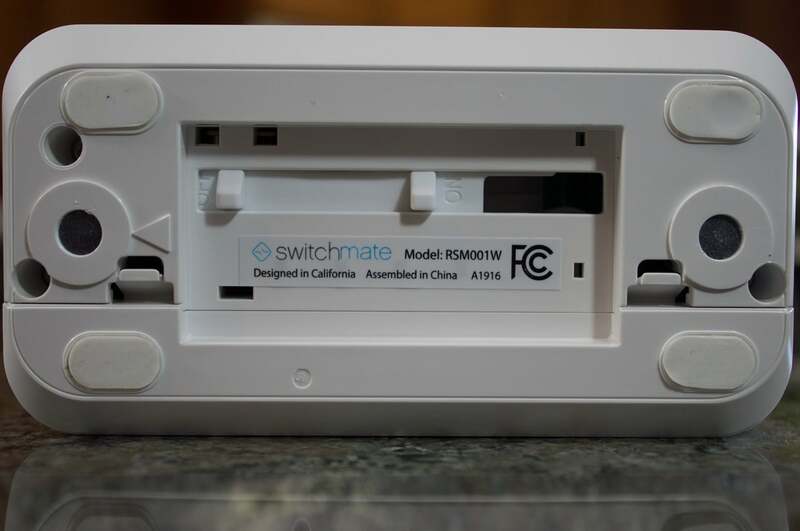 Installing the Switchmate couldn’t be easier: A pair of strong magnets on the back hold it to the screws on your existing switch’s cover plate. You don’t need any tools, and you’re never exposed to live wires. The Switchmate app (available for Android and iOS devices) steps you through the process and—provided Bluetooth is active on your device—quickly pairs your phone to the Switchmate. I can’t overemphasize how easy the Switchmate is to install: You’ll spend more time downloading and installing the app than attaching the device to your existing switch. I didn’t even have to futz with positioning it over my rocker switch to make it work right the first time. Was your switch installed upside down, so that the up position is “off” and the down position is “on?” No problem, just click a button in the app and the Switchmate will take that into account and switch up for down. The manufacturer chose Bluetooth Low Energy over Wi-Fi in order to preserve battery life, which is rated at 8 to 12 months. The Switchmate isn’t wafer-thin. I would hesitate to install it in a high-traffic area because someone might bump into it and knock it to the floor, possibly breaking it. Once installed, you can turn the switch on and off using your smartphone, program it to turn on and off according to a schedule, or control it the old-fashioned way—with your finger. As great as that is, the Switchmate does have some deficiencies. Most importantly, as strong as the magnets are, there’s no way to permanently fix the Switchmate to your existing switch. The Switchmate is just over an inch thick and is slightly less than five inches tall, so it does stick out from the wall. If you—or more likely your kids—bump into it with enough force, it can be knocked off and fall to the floor. If the floor is a hard surface, the Switchmate might break. I dropped it to a carpeted floor with no ill effect, but I didn’t try it on my hardwood or tile floors. 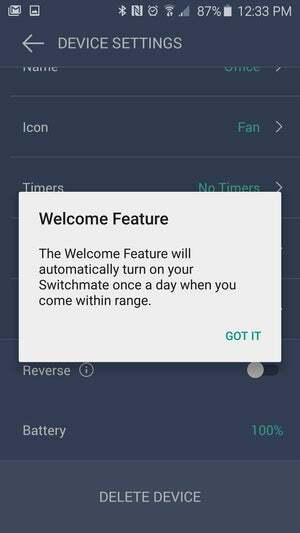 The Switchmate app’s scheduling feature is exceedingly rudimentary: It consists of simple timers that turn the switch on at a defined time and then off at a defined time. The app doesn’t take sunset and sunrise into account, and the only option for creating a schedule is to have the timer repeat: “Every Sunday,” “Every Monday,” and so on. There’s no setting for “Monday through Friday” or “Weekends,” and you can have only three timers per switch, so you can’t create one for each day of the week and have them repeat to get seven days of events. 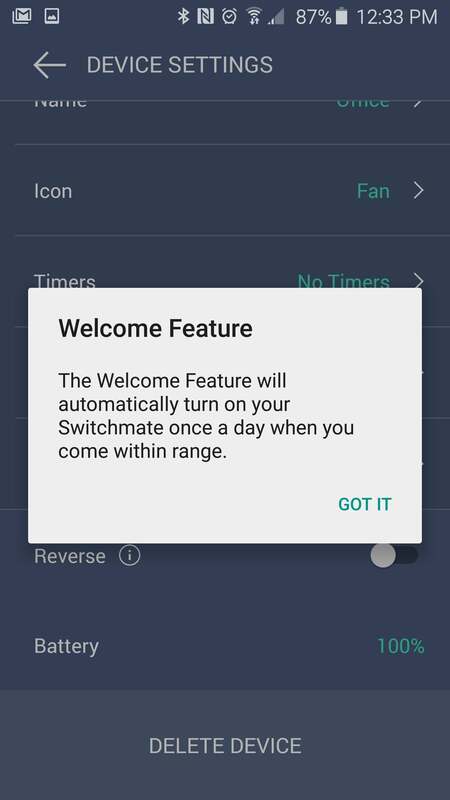 The Switchmate’s Welcome Feature isn’t all that smart: It turns lights on and off according to the time of day, versus determining your physical location via geofencing. The app’s Welcome Home feature, which turns a light on when you arrive home and off when you leave, isn’t based on geofencing—those are simply scheduled events. I usually get home at 5:00 p.m., so I’ll program my porch light to turn on at 4:50, so it’s on when I approach the door. Finally, the Switchmate is a simple on/off switch. It won’t dim your lights or change the bulb’s color, if your bulbs are capable of those features. 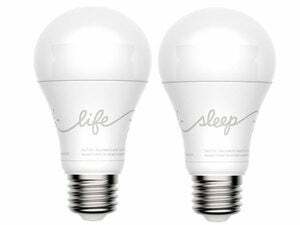 If you’re using smart bulbs, you could use the bulb’s app to brighten and dim the bulb, change its color, and even turn it on and off—but needing to use two apps to control one light bulb is stretching the premise of smart lighting in my book. Those criticisms aside, I think the Switchmate is a brilliant product for people who don’t want to go through the hassle of installing more elaborate—and more permanent—smart lighting solutions. The scheduling issues I’ve mentioned should be easy enough to fix with an app update, but providing screws as an alternative to the magnets will be a little more difficult for Switchmate to pull off. The Switchmate team is also working on a smart-home hub that would give users a whole lot more control over their smart lighting. The $40 price tag is comparable to what you’d pay for an in-wall smart switch from the likes of GE, Jasco, or Leviton, but it doesn’t require a hub, and you can take it with you when you move. The Switchmate folks even point to use cases such as installing the switch in an RV and taking it with you to a hotel. This is a very good product that could end up being even better down the road. It’s not for me as a smart-home owner, but I like it a lot. This is a brilliantly simple smart lighting solution. But it's also simplistic, lacking the advanced features that smart-home enthusiasts will want.